“I’ll control how you eat, sleep, and work,” David Greenfield promises a new trainee, “so I hope you like getting Whatsapp messages.” Today is “interview day” and so the class is a mix of experienced athletes like distance runner Chi Nguyen who has just won the Garmin Vietnam 10km race and potential new recruits—if they impress the coach enough. Born and raised in Jamaica, Greenfield was a college lacrosse player and then a dancer in New York before discovering the triathlon. “In NYC, I lived a nocturnal existence always going to parties,” he remembers, “then one morning I’m heading home from an all-nighter groggy and overweight and I see an advertisement for the triathlon in a magazine in the window of Tower Books. I bought the magazine, read it that afternoon, and started my new life as a triathlete the very next day…” After a successful career as a professional triathlete and national champion, he’s gone on to develop athletes of all levels including many Olympians and champions. 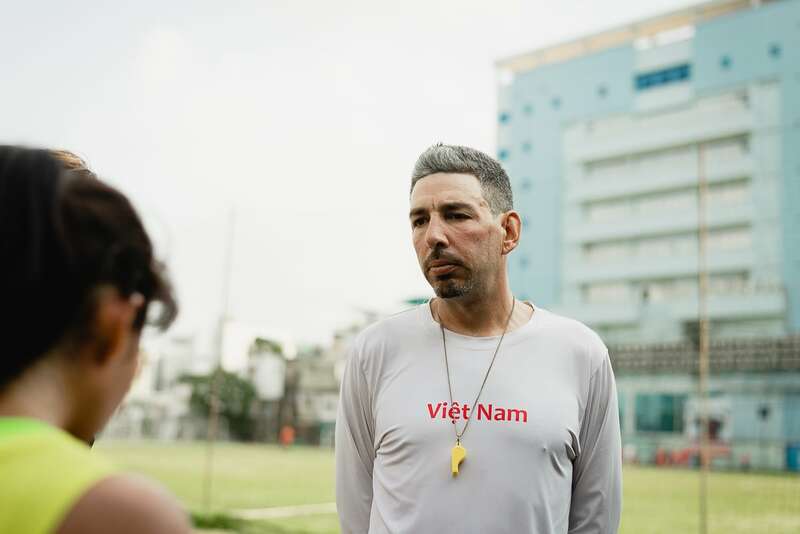 Before he starts the next class, we take a seat trackside at Saigon’s Hoa Lu Stadium with David Greenfield to understand his tough approach to training and the prospects for the athletes he’s developing for the SEA Games. David Greenfield was born in Kingston, Jamaica and has gone on to train champions and Olympians. What are three simple things any runner can do to make immediate improvements? One, run as tall as possible, think about lifting your rib cage—your chest—and elongating and engaging your core. This action will also expand your diaphragm and allow you to breathe more freely and deeply. Two, touch your thumb to the first knuckle of your forefinger. The kinetic engagement pattern created will put a very light tension in your shoulders that will assist you with torso stability while aiding a fluid arm swing, which will in turn reduce unwanted upper body oscillation. And three, listen to your feet—try to land midfoot and make as little noise as possible. The alternatives could cause damage over a prolonged period. I’ll give you fourth, as a safety bonus. If you must use headphones while training outdoors, make sure the volume is low enough that you can still hear the traffic around you. And if you run at night, please remember to wear reflective clothing. And what separates an average athlete from a great one? On the track, I like to say it’s knee drive. But truth be told, the answer is commitment, and the ability to truly suffer physically, emotionally, proprioceptively, nutritionally…and financially—and to come through it. There’s also a need for the appropriate goal setting, level of intensity, and periods of recovery. What are the key elements to a training session with you? Form, form, and form. And then balanced physical development. There’s also lots of intensity, a focus on functional movement, and imparting education, while looking for continuous improvement. Which act of sporting success are you most proud of having coached? How would you describe yourself as a coach? How do you think your trainees would describe you? I’m attentive to scale—as needed by each athlete at the time during training and when racing. I’m productive because I have an agenda for the day and beyond. I work hard to make sure my trainees get stronger, faster, and more efficient and more knowledgeable with each session. I’m also protective, because my core guiding principle is keeping my athletes physically safe when needed, and free from injuries and judgment. And I hope I’m insightful too. I continually try to learn how to best communicate my desired results for form, function and improvement with each athlete. Plus, I try to provide them with pertinent information and understanding for why we are doing what we do in every session. And I think I’m forgiving too—I’m very forgiving about the realities of life—though my trainees may feel I’m a bit unforgiving during workouts. If you could be any athlete of any era, who would you like to be? Me, as a teenager. But with more direction, guidance, and direction towards the sports and events I’m genetically predispositioned to excel at. Fortunately, with 4 years of very hard work and a strong work ethic, I was able to progress from an amateur to a professional athlete representing Jamaica. I competed across the full distance ranges from sprint to full Ironman throughout North and Central America, the Caribbean, and Europe in both ITU and WTC sanctioned events, always pushing myself on the bicycle all the way. My personal highlights would be the overall win on Jamaican soil in 1999, and qualifying as a professional for my first Hawaiian Ironman world championship—the one I had dreamed of attending. My low point would have to be the day I realized that regardless of perfect training, diet, and scheduling, I just genetically did not have what it took to get on the podium or even in the money at an international ITU or WTC event. David Greenfield’s approach to training focuses on “form, form, and form” but includes a holistic approach to physical development and maintenance. What made you move between Jamaica, New York and Philadelphia, and then East Asia? Career opportunities for my overachieving parents meant I was born and spent my formative years in Jamaica until political unrest forced us to leave. Mum was given the choice of the three cities that Air Jamaica was still flying to then—London, Miami or Philadelphia. So I ended up being educated in Philly with holidays in Jamaica. Nightlife took me to NYC, then renewed focus and stability brought me back to education as a trainer’s assistant, and newbie triathlete. Racing helped me to see much of the world and re-establish a home and training camp in Jamaica. After racing, my commitment to my family and building the Elite Bicycles brand kept me in Philadelphia for over ten years until a request for an Elite concept store took me to Singapore. Then continued opportunity took me to Manila and Ho Chi Minh City. Obviously there are many places in the world I could base myself…but I chose Vietnam. Which Vietnamese athletes are you training for the SEA Games? How will they do? I’m training two extremely committed and naturally talented young Vietnamese ladies, Lam Tuc Ngan and Ni Nguyen. They each have their own strengths and weaknesses, however we should be able to build them both up to be competitive regionally by December for the SEA Games 2019 in The Philippines. 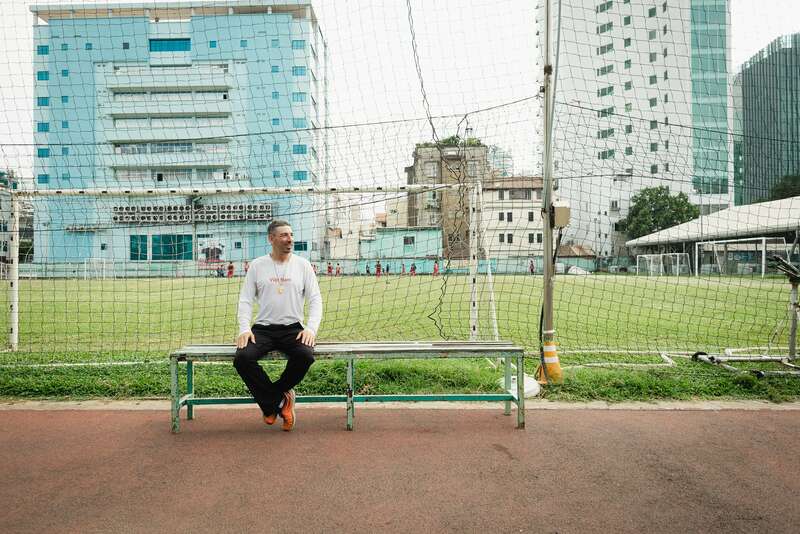 David Greenfield at Saigon’s Hoa Lu Stadium waiting for the next class to start. Finally, do you believe in natural talent? Or is everyone trainable?